First up, I need to grab my spoon and dive into a piece of humble pie. We have been making a real effort to connect you to better, fresher, healthier meat sources. And quite honestly, we have done a good job for the most part. The real issue that I have seen has been running short on meat orders after a member places the order. I could bore you with all of the logistical issues why this happens, but I would rather focus on how we will fix it. We have been allowing members to place meat orders up 4 weeks out. That is great but that is not how we are structuring the meat market so it is a classic example of an over-promise, under-deliver situation. The goal of the expanded meat selection is to bring in fresh meats and get them out to your kitchen as soon as they come in. Fresher product for you, less freezer storage needs for us. So we are going to be changing the ordering system to meet the needs of the system and hopefully cut way down on any product shortages. So you will not be able to order meats 4 weeks in advance of your delivery date. You can still order broccoli that way, but the meats have to be handled differently. So every Friday when we post the boxes for the upcoming week, we will be putting up for sale only the meats that we have available. No guessing or wondering what we might get in the future. What we have on-hand is what we will offer you for that week. I think by doing this it will accomplish the goal of cutting down on the dreaded “Out of Stocks” as well keep freshness as our main goal. Thanks for your understanding on this and I give you my sincerest apology if you have ordered meats and not received them. Moving on to a poster I saw this past weekend reminding folks about the rights of farm workers. Seeing the poster actually made me think that I take for granted the rights of our farmers. But maybe not in the way you would think. All of our farmers earn at minimum a living wage, get a free Harvest Box a week, pay wholesale prices for all other food (and cider), have access to health benefits, get 2 weeks paid time off a year and overall get to work with amazing people. This is what farmers’ rights mean to us around here. And we would have it no other way. But like I said, I do take this for granted sometimes and this poster was a good reminder for me to remind you about the type of labor practices that you support every week with your food choices. We are able to offer our farmers all of these benefits for one reason—because you support us. The farm, like any other business, is under intense budget demands. So making our employees a priority has to come from somewhere. That somewhere is your support. So I want to take this moment to let you know that I appreciate you supporting our model and that it goes to good people who keep (and spend) the money in our communities. Which is great for our local economy. That is our philosophical outlook on paying farmers well. But, selfishly, I have another reason we do—to attract more farmers to the fields. If the high school kid mowing lawns during the summer makes more money than a farmer, you will be hard-pressed to get new farmers in the fields. We have to design and implement systems into our local food landscape that is enticing to potential new farmers. Sure this may never be huge stock options or jaw dropping salaries, but they are livelihoods. Honest salaries for honest work. Something everyone can feel good about. So the calendar is saying it is the first day of spring, but I would argue it just has not arrived yet. By this time of March, spring has usually sprung. People in their yards. Nurseries full of excitement. Farmers’ Markets and CSA starting to gain some momentum for the season. And quite honestly, we just are not seeing it yet. It will come, I know that, but I am just getting impatient. All in all, it has not been all that bad with the mild weather. It has given us a chance to get baby plants out in the field without the stress of an 80 degree day followed by a 34 degree night. So the silver lining on this late spring for me is that we should have healthier baby plants to show for it. Speaking of healthy plants, I think it is time to have our Spring field walk. 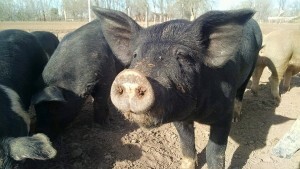 So let’s have a farm tour next Saturday, March 28th, at high noon at the farm in the South Valley. We had our last tour in January to see what a wintery farmscape looks like, so let’s get you back out for an early Spring tour. Directions to the farm are on the web site. This, as always, will be a free tour that will take an hour to an hour and a half depending on questions. Please feel free to bring any non-farm members to introduce them to the local food movement. Please leave all dogs, cats and hamsters at home though. Thank you and hope to see you down there. Another quick event blast that you should put on your calendar. May 2nd we will be hosting our annual Spring Plant Sale at the warehouse garden. We had over 400 people come out to the Plant Sale last year and it was a very fun day. There was a brainstorm floating around as to how we could make it better. Simple, add cider! So we are happy to announce that the farm together with all 3 cideries in Santa Fe will be hosting the first ever New Mexico Cider Festival on the same day as our plant sale. This should be an epic event and I want to get it on your schedule early. Unless you are attending the Kentucky Derby that day at Churchill Downs, I want to see you here. Lastly this week, we are going through the process to fix up the back of the newsletter. More useful, more tips, more better. Right now it has been kind of fluffy. I don’t like to admit that, but it just has been. So our goal is to add two (pertinent) recipes a week, some tips from the web site, and storage ideas for the produce. With that, I ask you to share with us any recipe ideas you may have for spring veggies and then we’ll transition into summer. We want these recipes to be short (like 20 minutes to prepare) and refraining from recipes that need wild flax seeds from Kerplakistan (ie stuff you already have in the kitchen). So look for this new facelift on the backside of the newsletter and don’t be afraid to share those recipes from ole’ Aunt Edna…except maybe the Jello Salad. Reminder that this will be the last week for the pre-pay discount this Spring. For every $1,000 you prepay, we will add $100 to your account. If you are interested in this, don’t wait because this will be the last week. Have a great first day of Spring. The snow is gone. The sunshine has returned. And spring is starting to show her face. With all this warmth, the fields will begin to fill up quickly at the farm. This week already saw over 5,000 tomato plants hit the protective confines of our greenhouses. We always try and hit a 4th of July first distribution date for tomatoes and hopefully this year will be no exception. Stay tuned for more stuff from the farm. On a housekeeping note: Recurring Orders. Most of our members know and use this great functionality of setting up recurring orders on their accounts. Personally, I go through a gallon of milk a week and a pound of dark roast coffee every two weeks. Both of these things I have set up on recurring orders along with a weekly medium Harvest Box. I bring this up because “I’m not only the hair club president, but I’m also a client.” So I know firsthand that the recurring options help me a lot in my meal planning, but it also helps the farm in our planning. If you have been around for longer than a month, you know that we strive to (and have succeeded) in cutting down the time from order to delivery. This has been no easy feat for us. For you to order by 10 a.m. and then have your order by the next day takes some real systems management as you can imagine. We are only able to make that happen because of the use of recurring orders. It lets us know in advance what the rough orders will look like and prepare for those orders. Still, even with the recurring orders that we have in place, our weekly orders can fluctuate up to 250 from the start of the week to the end. So here is my plea to help us help you. The more we can plan, the better quality you will get and the fewer shortages you will receive. And with your help of planning ahead, we will see this aspect of the deliveries continue to get better. Our fill rate right now for orders is better than 99% and we (you) would obviously love to get that to 100%. So try out the recurring order functionality if you have not done so, I think you will really like. A quick product note: beef. As I have been highlighting recently in the newsletter, we have added a pretty comprehensive local beef program to the already awesome produce boxes. This week, one of our cows was being processed and the USDA inspector who was overseeing the operation commented that it was the finest looking animal that he had seen in his entire career. When I hear that from someone who really knows animals, I have to smile and feel that we are doing the right thing for our members. It also is a reminder for me that our model is really working. And the strength of our model is rooted in diversity and the passion of our network. Let me explain. There seems to be this undertone of the local food movement that a farmer has to do everything. Be everything for everyone. Harvest the carrots, make the bread, and milk the cows. That specialization is somehow bad for agriculture. Now I agree that we do not want to turn our farms into the monocrop landscape that has taken over the Great Plains, but we have to realize that specialization is at the root of passion. Before we ever look at prices, before we ever examine quality, we look at the passion of our potential partners. And so the first question we ask possible partners is “do you love what you do as much as we love what we do?” If the answer is yes, then we have a foundation for a partnership. When you talk with Paul from Excelsior Orchards about his trees, there is reverence. Ask Mike or Scott about milk, and you find out that milk is what ties generations of their respective families together. Talk to the Perez father and son team about beef, and they mention cows in the same way you would talk about family members…the ones you like! Putting all of that together, you end up saying, these are the people I want on my farm team. You have the A-Team on your side, well maybe minus Mr. T.
So rest easy this season knowing that no one is going to be eating better, fresher or closer to the source than you will. A Slow Start to Spring, But It’s Here? First off, a quick reminder about the Prepay Discount that we will continue through the end of the month. For every $1,000 you prepay to your account, the farm will add $100 as a Thank You for your continued support. You can use this credit however and whenever you choose. On the meat side of things, we have just received more beef and pork into our new walk-in freezer. Jump on to try all the wonderful flavors. The demand for our meats has gone through the roof over the last year, so we are trying to catch up. I would like to apologize if the supply on meats has been frustrating. It has been a major hurdle for us, but think that we are on the right track to increase our supply, while not cutting any corners on quality. We want to only bring you the best, so that has lead to shortages. But we are working on it. Thanks for your understanding and patience. So, as you all are pretty well aware of, February came in like a California beach and left like a North Dakotan tundra. I have not seen a snow fall like we had last Friday in about 10 years. I measured over 9” of snow Saturday morning and I am sure many places got a lot more. I am happy to say that none of our greenhouses or animals were affected by the snow fall. I was afraid the weight of the snow could collapse a greenhouse (I have seen it before), but fortunately everything is still standing. We did not really have anything in the fields so the moisture was a welcomed sight. The only real issue that we had due to the storm was pushing back our spring plant-out dates about a week. 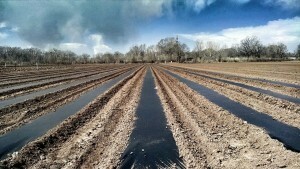 Looks like mid 60s for the next week, so we will have thousands of plants hitting the soil for their spring push. 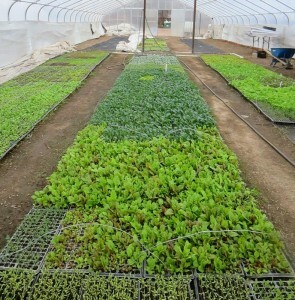 Exciting time to see a greenhouse full of baby plants get emptied out into the fields. Seeing this large transplant, it is easy to understand why our propagation greenhouse is the epicenter of life for the whole farm. 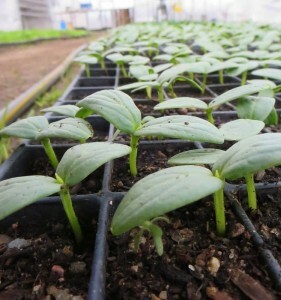 And why there is no place on the farm that gets as much attention and TLC as the propagation house. Lastly this week, our intern Manager and Coordinator, Ash, has asked me (ok, maybe pleaded) to send out an APB for more interns in the newsletter. So here it is. If you or someone you know is looking for an apprenticeship on a farm, we need you. As I have mentioned previously, we are expanding our internships to be a larger and more dynamic role here at the farm. We put a ton of energy into this program and it pays off for our farm and our local farms that spawn from this training. What else is happening this week? Shoot, I would have to say that the arrival of spring flavors is in full swing right now. Tender roots (radishes, beets), dark greens, peas, asparagus, and shortly strawberries are all coming in from the fields. I have to admit that this is one of my favorite times of the year as a veggie-lover. This is the time for transitions. We begin the migration from using our ovens to lightly sauteing things on the stove top. The final summer resting place is always on the grill for me though. I encourage you to look at yourself and what your body is craving this time of year. I think we start to not think about our crock pots as much even as they sustained us throughout cold short days of winter. Salads begin to have some more life to them as peas and baby peppers spice up the mundane. All in all, enjoy this transitional time with your food. Building this connection with our food and the seasons grounds us. It is the refuge from the storm of monotony that we see in the grocery stores. Enjoy the journey amigos.